Nothing beats finding new friends. What a great way to connect with our "online" community. Hope you can all take a look at the blogs and find inspiration in them. Have a great week exploring!!!!! The first photo of a Hidden Wells quilt hit my mailbox on Tuesday. A beautiful finish from Kathleen. Wow girl you are speedy! 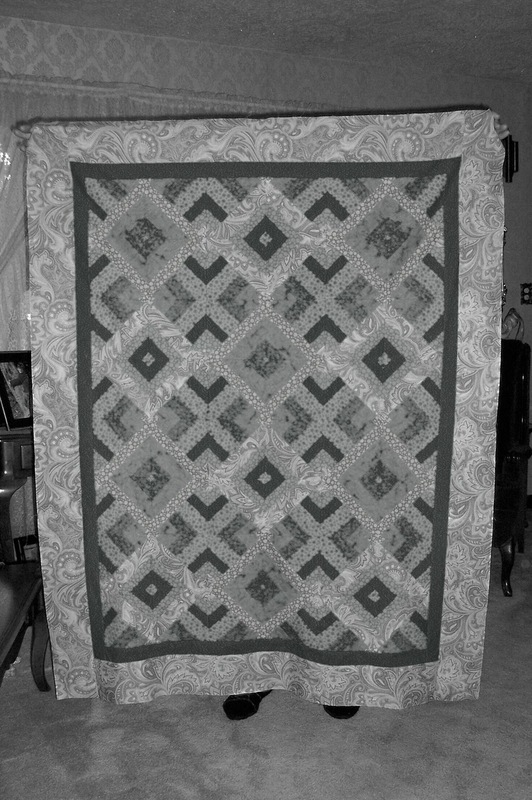 As an additional surprise she send along a photo of the same quilt printed in black and white to show the color values. That's a great way to look at things. I have heard it before, but until I saw it again, I would have never thought of it. I am a very visual person, which probably explains the very long tutorial, so I really appreciate your photos Kathleen. You did a great job and I love the colors. Thanks for inspiring me, and sharing with us all! 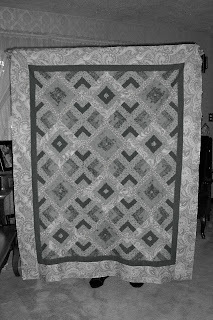 I am wanting to make a black and white "Well" quilt now, and the thought of animal prints keeps dancing thru my head. We will have to see where that leads me. I am hoping to have the pink tutorial quilt finished up real soon. It is a baby quilt (hence the same color palette, that I urged you "not" to do) but it works with what I did with the quilt and I can hardly wait to share it with you. I am just waiting to get confirmation of baby stats so I can embroider it and finish the quilt. This quilting community is such a wonderful and sharing one, that I feel so privileged to be a part of. Having never written a tutorial before, I put it out there and asked for feedback. Immediately I had an inbox full of postive responses, and a couple catching my errors. Thank you so much for helping me thru the process. The errors have been fixed and I do look forward to seeing your wells soon. I have been busy putting the finishing touches on my teaching materials for "Hidden Wells" and decided to share it with you. I hope that you find it helpful, and would love to see how it works for you. Any feedback on your likes or dislikes, would be greatly appreciated. Wishing you the best in your own creations! You are about to embark on one of the most fun projects I can remember. It takes very little fabric to accomplish, and is a great way to use up that “stash” that most of us have managed to collect thru the years. If you have as little as ¼ yard of 5 different fabrics, you're on your way to a wonderful table runner size quilt. 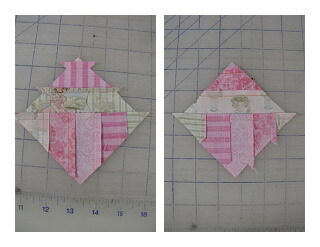 Working with ¼ yd cuts of fabric, I cut 1½” strips of the 5 different fabrics. Four strip sets consisting of 1 strip of each of the 5 fabrics will yield a nice size table runner with a few blocks left over. Before we start cutting and piecing our strip sets, you need to starch the fabrics. I can not stress enough, how important it is to starch the fabrics. I have found the way that works best for me, is to use straight liquid starch like “Sta-Flo” in a stray bottle. The easiest way to do this is to spray both sides of your fabric heavily and let sit on a flat surface until it has dried. I spray and stack up my fabrics on top of each other, then allow to sit until dry on my ironing board. I used to try to rush this process by ironing the fabrics right after spraying, but it is very sticky and messy and cleaning the iron afterwards was a chore for me. Now I try to preplan and spray at night, so they are ready to start cutting in the morning. After cutting 4 strips of 5 different fabrics 1½” wide, we start piecing our strip sets. Paying careful attention to a good ¼” seam is a must. A reliable ¼" foot on your machine, is a must. Or one of my favorite tips is to take double stick foam tape and place it on the bed of your machine. By using a ruler under the foot manually lower the needle until it touches the ¼” mark on your ruler. Place your tape strip directly on the bed of the machine. This creates a wall of sorts and makes it harder to cross over as you stitch down your fabric strips. Needless to say, it is easy to “not” have your fabrics touching the foam “wall” as you sew so take care and stitch slowly. I have found that by holding the 2 layers of fabrics in different hands makes it easier to keep them both lined up against the foam tape as you sew. Give it a try and see if it is a fit for you. Piecing! I prefer chain piecing the 4 strips sets then cutting them apart when I have finished. If you are more comfortable piecing each strip set separately, go that route. The end is the same either way. As I piece I add the next fabric to the top and press over without steam before adding another strip. It’s important that all seams are pressed in the same direction. Once your strips are complete, measure the width. They should all be fairly close. There is a little wiggle room, but the more accurate they are the easier it will be to piece the blocks together. Lets cut our strip sets into blocks now. Here you want perfect squares, so whatever the width of the strip set is, will be the block size. On a typical strip set of 5, 1½” strips, it should measure 5½” wide, so we want to cut 5½” squares from the strip sets. When cutting your blocks from the strip sets make sure to keep them square. If you see that your ends are not straight, take the time to even up the strip set again. Now we will take our 5½” blocks and cut them on the diagonal 2 times. Here is where all that starch will start to pay off. You will have lots bias edges to work with. Make sure when cutting your blocks that you keep them is 4 separate piles A B C and D.
It is very easy to get them mixed up so sticky notes will prove to be invaluable here. Once all your blocks are cut, we will start piecing. Again there will be 4 piles. Again sticky notes will make things much easier for you and I like to make mine as follows. 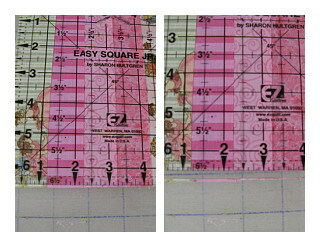 Using this marking will help in orienting the squares when constructing our quilt also. We start with piecing the 2 triangles together. Always keep you’re A and C triangles on the bed of the machine placing the B and D triangles on top. You see that the triangle on the bottom will have the strips running top to bottom. This way when you place your top triangle on it, you can flip the horizonal seams down as you sew. Ironing is the key in this step. If you take the time to iron each block in the direction shown it will help by keeping seams going in opposite directions, so they will “lock” together as you stitch them. After piecing all our triangles together press open. Below I have shown the direction that each block should be pressed. Make note of how the vertical seams are pressed opposite directions. A/D and C/B seams are pressed with the vertical seams to the left A/B and C/D with vertical seams to the right. Make sure once your blocks are all pressed that you take the time to trim off the dog ears. It will reduce the bulk in your quilt. Once all our blocks are pieced it’s time to play. This is when those wonderful designs start to come together. Remember our block numbers? I use my tiny triangles (on the outer edges) of Green stripe and Pink Print as my focal point to keep my blocks lined up the correct way through out the quilt. Now for our second block. Below are some of the options for my quilt. The one thing I found when putting together my rows, is that some days I am able to lock my seams and have everything come together perfectly as I go, other days nothing matches up. If you find that you are having troubles matching the seams up, PIN! It is a must that they match. I have even used the ole basting stitch tactic, which makes it easy to rip out a few stitches where things do not line up very well then re-stitch. Once I am satisfied with the row, I tighten up my stitch length again and stitch right on top of my basting line. Use whatever makes your life easier! Here are a few photos of what I have done with extra blocks. Mixing and matching is fun. A great little mini-quilt. Perfect for a candle mat. This is a quilt that needs lots of variety. The more "different" the colors the better it works. Over matching colors just does not give the results that a “wild” assortment will. Throw in something completely off the wall, either something horribly ugly or so far off the radar that you can’t imagine what will happen. These tend to lead to stunning results. 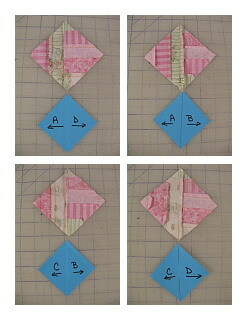 Also keep in mind that the first and last strip in the sets will drive the overall focus point of your quilt. They are what make up the 2 different diamond shapes created from the blocks. Varying your strip widths will give a very different look too. Just keep in mind that you don‘t want a seam running down the center of your strip set. Working in odd numbers is a must. 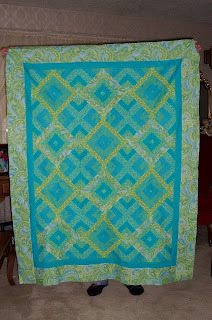 5 strips is ideal for a table runner size quilt. 7 is great for larger ones, but any odd number combination works. The next two photos are of quilts made with the exact same fabrics but strips cut at different widths and placed in a different order in the strata. By keeping the middle strip a little wider, it will help keep you from having to deal with small dots of fabrics that form as the blocks are constructed. If they are not all the same size, when the quilt is complete, you will definitely notice it. If you look in the above photo of the completed blocks you will see what I mean at the very center of the blocks. ARRRGH!! :-) But for the 1½” strip sets I like to work with, for table runner size, it happens. 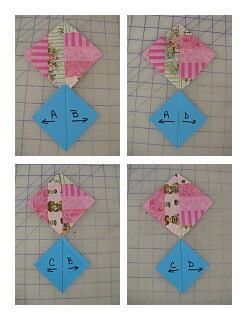 When using fat quarters, make sure that you allow for more strip sets. I was able to get 3 blocks per each 5½” wide strata. You get 7 blocks on the full 45” width strips. There are a couple of web pages I have referred to for information on Hidden Wells. Has very in-depth information of yardages required for different size quilts, along with many of her own experiences with Hidden Well quilts. Is another source that has some great instructions and the one that I have used as my Hidden Wells Bible. Both are great sites. 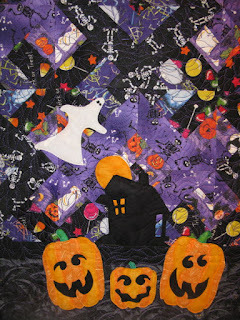 I based my tutorial on them both and added photos to hopefully give you a different insight for this wonderful quilt. Now go off and create your own masterpiece, and by all means share it with me. I can hardly wait to see what you dream up! You can send your photos to Calicojoan@q.com Please refer to Hidden Wells in the subject line so it doesn’t get lost in my spam folder. Please let me know if it would be okay to share your creations on my blog from time to time too! 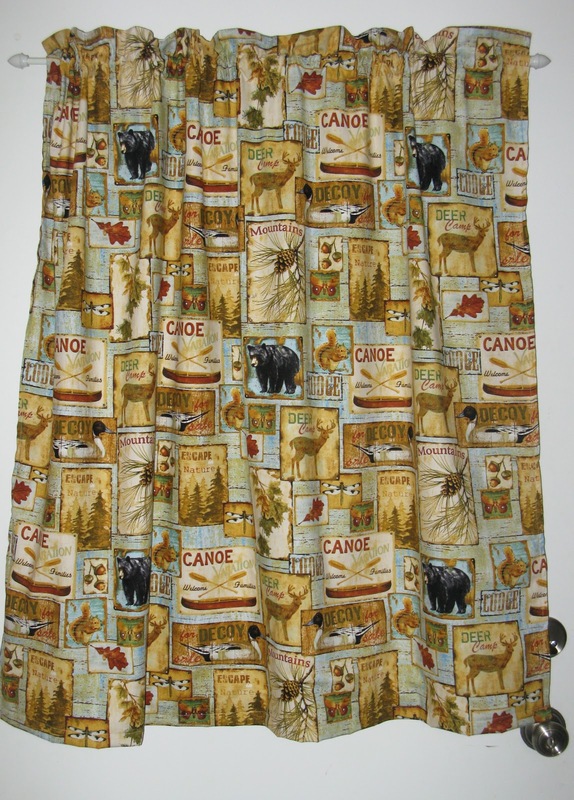 I am back from Alaska, and while I didn't get much sewing done while I was there, I did manage to get curtains made for my son's place. I found some great lodge look fabric that fit in quite well with his new digs and stitched up very simple curtains for 4 rooms. There was enough fabric left over to make some pillows to match and a bathmat and matching towel sets. I managed to bring home enough to probably make a pot holder too!! hahahaha I have bombarded him enough with little treasures. I will keep the pot holder for myself! :-) It was a cold and rainy trip this time. They broke a record last Saturday for the most days with measurable rain (28 days) that was set in 1951. Needless to say it rained Saturday, Sunday and Monday. I came in on the red eye on Tuesday morning and had a call that it stopped raining and the sky was blue. Doesn't that just figure! The day I leave. All was not a loss though, with all that rain came millions of mushrooms. I took a few walks with my camera. I have never seen mushrooms the likes of some of these. There were so many and so many different shapes, sizes and colors. Living in dry climate I don't often get to see things like these. When we do get mushrooms they all seem to be the same old boring gray mass around here. This guy looked like a pancake that had been tossed on the side of the road. I am so truly captivated with all these little things, that I can't seem to get the idea of some kind of a photo art quilt out of my head. Watch out, you never know when that will appear! I suggest that you grab a camera and take some photos of something that inspires you too and see what happens!